I don't know that I would quite describe myself as a tanorexic, but I do love a good tan and feel more like myself when I am tanned. I wear fake tan all year round and at this stage consider myself to be quite the fake tan aficionado because I have tried most brands (but Bellamianta and Loving Tan are still on my "to try" list!). One of my favourite tans is Xen-Tan Moroccan Tan because it applies very evenly, doesn't dry my skin out, gives a really golden tan and fades evenly. The only 'con' I can think of is that the tube is small at only 148ml and because I apply fake tan once a week, it really doesn't last very long. 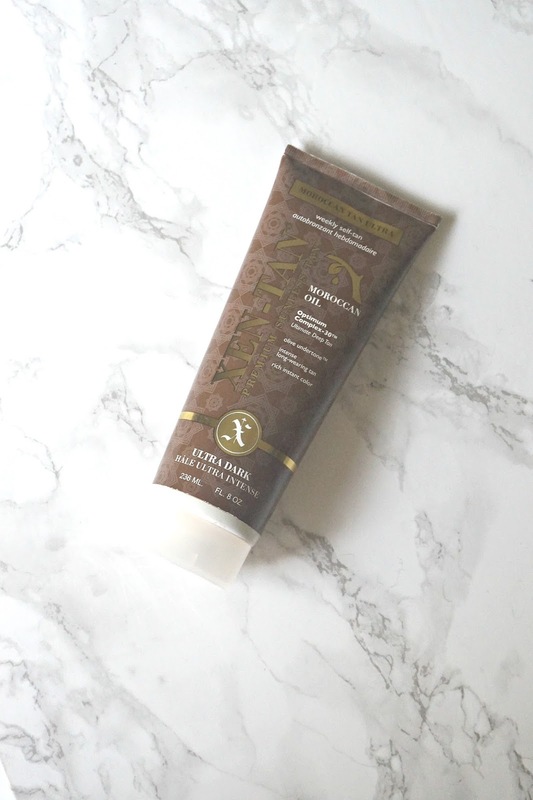 I have tried most of the other tans in the Xen Tan range and this one was always my favourite. When I saw that there was a new release - Moroccan Tan Ultra, I was intrigued as to what the difference was, but delighted to see that it came in a bigger tube. Having said that, I was baffled by the price because it was twice the price of the original tan but with 236ml in the tube, which isn't twice the amount. Because of that, I waited until the January sale to buy this new tan because I couldn't justify the price until it was reduced when there are other less expensive tans that I really like - Bondi Sands, for example. This new "Ultra" tan contains a new ingredient (a breakthrough in DHA is how Xen-Tan describe it), which means that the tan should stay dark for a full 5 days before fading - whereas with most tans, they will be darkest on day 1 and then fade little by little over the next 5-7 days. I was eager to see how true this was so I have given it a few uses and I now have mixed thoughts. It has a guide colour so it is easy to see where you have applied and if there are any streaks. It gives a very deep tan, but it doesn't look orange or even too bronze - just a deep, golden tan, which I personally love. It lives up to it's claim of staying dark for 5 days. It is quite difficult to apply due to the gel-lotion texture and I found that I used more than I normally do with other tans in order to spread the amount all over my body. It is very sticky, which means it takes a while to dry down - if I get dressed too quickly, my clothes stick to me. It smells like traditional fake tan, whereas the original tan or Bondi Sands smell quite nice - almond/coconutty! That being said, the smell doesn't linger the next day as it does with some tans. It is expensive (although I always wait for discounts before I buy any fake tan and Xen-Tan often have offers on so it is worth signing up to their newsletter to be notified). If you like to tan before going on holiday, this would be a good option because it will last evenly for the duration of your holiday without the need to top up (if you are away for a week). It definitely has its benefits because you can rely on it for a nice deep tan (if that is your choice) and although the texture makes it a little difficult to spread, the result is a streak-free tan. I can't see it becoming my favourite weekly tan, however if I had a special occasion it would definitely be my tan of choice - I would just have to get past the stickiness & whiff the night that I apply it! Have you tried this tan? Are you a weekly fake tanner or is it just for special occasions for you? What is your favourite product? I would love to hear in the comments below!